Historians working in Germany and the US claim to have found a 60-year-old diagram showing a Nazi nuclear bomb. It is the only known drawing of a "nuke" made by Nazi experts and appears in a report held by a private archive. The researchers who brought it to light say the drawing is a rough schematic and does not imply the Nazis built, or were close to building, an atomic bomb. But a detail in the report hints some Nazi scientists may have been closer to that goal than was previously believed. The report containing the diagram is undated, but the researchers claim the evidence points to it being produced immediately after the end of the war in Europe. It deals with the work of German nuclear scientists during the war and lacks a title page, so there is no evidence of who composed it. One historian behind the discovery, Rainer Karlsch, caused a storm of controversy earlier this year when he claimed to have uncovered evidence that the Nazis successfully tested a primitive nuclear device in the last days of WWII. A number of historians rejected the claim. The drawing is published in an article written for Physics World magazine by Karlsch and Mark Walker, professor of history at Union College in Schenectady, US. 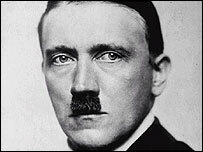 The newly uncovered document was discovered after the publication of Karlsch's book, Hitlers Bombe (Hitler's Bomb), in which he made the nuclear test claim. "The Nazis were far away from a 'classic' atomic bomb. But they hoped to combine a 'mini-nuke' with a rocket," Dr Karlsch told the BBC News website. "The military believed they needed around six months more to bring the new weapon into action. But the scientists knew better how difficult it was to get the enriched uranium required." The head of Nazi Germany's nuclear energy programme was the physicist Werner Heisenberg. Though he was highly accomplished in other areas of physics, Heisenberg failed to understand a key aspect of nuclear fission chain reactions. Some researchers say this led him to overestimate the amount of uranium - the so-called fissile material - required to build a nuclear bomb. However, the German report contains an estimate of slightly more than 5kg for the critical mass of a plutonium bomb. This is comparatively close to the real figure and may suggest some Nazi scientists had a better grasp of nuclear fission than Heisenberg. Professor Paul Lawrence Rose, of Pennsylvania State University, US, and author of a 1998 book about the German uranium programme, said he had no reason to believe the report was not genuine, but was dubious about the significance of the critical mass detail. "Though it's wonderful to find the 5kg figure written on the document, one has to be sceptical about the rationale for it. Even if it's true and [some scientists] did understand it, Heisenberg's group wouldn't have accepted it," Rose told the BBC News website. He further speculated it was possible the author arrived at this figure by reading the Smyth Report into the development of the US atomic bomb, which was published in July 1945. But Karlsch and Walker reject this claim. In Hitlers Bombe, Dr Karlsch suggests a team of scientists directed by the physicist Kurt Diebner, which was in competition with Heisenberg's group, tested a primitive nuclear device in Thuringia, eastern Germany, in March 1945. Rose says that this is unlikely. Transcripts of conversations taped by MI6 when the scientists were held captive in England after the war showed Diebner lacked the knowledge to have done this, he says. "Karlsch revealed some very important details in his book, but I can't go along with the picture he constructs with those details - of a Nazi nuclear test," said Professor Dieter Hoffmann, of the Max Planck Institute for the History of Science, in Berlin. But in their Physics World article, Karlsch and Walker point to evidence of innovations made by Diebner's team, including a nuclear reactor design superior to that produced by Heisenberg's group. "[Diebner] got the research papers from all other groups and he could control the information flux. Only a few scientists around Diebner knew about his bomb project. Heisenberg was not aware of it," Dr Karlsch explained.